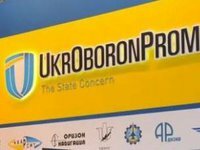 The total net profit of the enterprises being part of Ukroboronprom state concern in 2015 amounted to UAH 1.626 billion, whereas in 2014 their total net loss was UAH 348 million, the press service of the state concern said. According to information on the website of the state concern, sales of products by Ukroboronprom enterprises in 2015 are estimated at UAH 20 billion, of which about UAH 7 billion under contracts with the Ministry of Defense. According to the data voiced by the press service in December 2015, in January-September 2015 Ukroboronprom companies posted a gross profit of UAH 1.6 billion, while in the same period last year the companies saw a gross loss of UAH 345 million. The net income of Ukroboronprom enterprises for the first nine months this year increased compared to the same period last year by 37%, to UAH 14.4 billion. Created by the presidential decree in December 2010, Ukroboronprom, according to the law adopted by the parliament in June 2011, together with the government ensures the management of state property objects in the defense industry.